Why Did China Just Release 5 Feminists? China just released five women’s rights activists after a month-long detention. Why? Now, after an international outcry, the five women are free on bail. One of the women’s lawyers, Liang Xiaojun, told the New York Times that prosecutors had decided not to press charges – at least not immediately. The women are still under investigation and, in the meantime, will remain under police monitoring. However, experts believe it’s unlikely they will be formally charged at this point. As Sarah Cook of Freedom House argued in a recent piece for The Diplomat, the women’s detention was not truly surprising. Beijing has stepped up its bid to control social expression in China, both online and in the real world, since Xi Jinping assumed power in late 2012. Forms of expression previously tolerated in China suddenly became taboo — Uyghur professor Ilham Tohti, largely viewed as a moderate, wound up in jail, environmental protests have been broken up with force, and now feminist activists are subject to imprisonment. Against that backdrop, the real question is not why the authorities arrested the five women, but why they were released. International activists are already hailing the women’s release as a victory for the various social media campaigns to win their freedom (for example, #freethefive on Twitter). 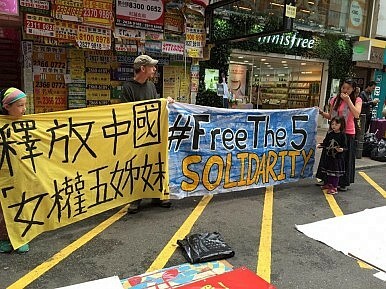 Protestors in Hong Kong and outside of Chinese embassies took the message offline and into the real world. Politicians joined in as well; former U.S. Secretary of State (and the favorite to be the Democratic candidate for president in 2016) Hillary Clinton tweeted her support, while current Secretary of State John Kerry issued a formal statement calling for China to “immediately and unconditionally release” the women. However, Beijing in general turns a deaf ear to foreign outrage over alleged human rights violations. An international outcry didn’t stop the conviction of Ilham Tohti on charges of separatism and Nobel Peace Prize winner Liu Xiaobo remains in prison. In fact, China often calculates that responding to international criticisms will only mean more criticisms later – if one series of protests is successful, Beijing’s critics will try the same tactics again. The idea of caving to international criticism of its human rights record is generally anathema to Beijing. The last thing China wants is to seem susceptible to foreign pressure. So what made this case different? It’s impossible to know exactly what calculations were made before deciding to release the women, but it seems likely that Beijing’s recent push for the “rule of law” was at least a partial factor. Though China will not be divesting the legal system from Party control, it does want to reduce the ability of local officials to interfere in the justice system. Beijing also wants to promote the image of an impartial justice system, to restore public confidence in courts seen as corrupt and unjust. The detention of five women for raising awareness of sexual harassment risked “politicizing” young women around China, according to Wang Zheng, a professor of women’s studies at the University of Michigan. “This generation grew up in the last 20 and 30 years, most of them not keen on politics. But they are being politicized by this event,” Wang told ChinaChange.org. It’s likely that no one factor led to the release of the five women. Each single one — international pressure, appeals to China’s justice system, and domestic frustration — has been brought to bear before with no success. But the combination of all three may have been enough to tip the scales in the women’s favor. In the past week, accusations of sexual harassment and assault have exploded on Chinese social media.